When we started our online business journey 6 years ago, our goal wasn’t simply to make a few bucks online. 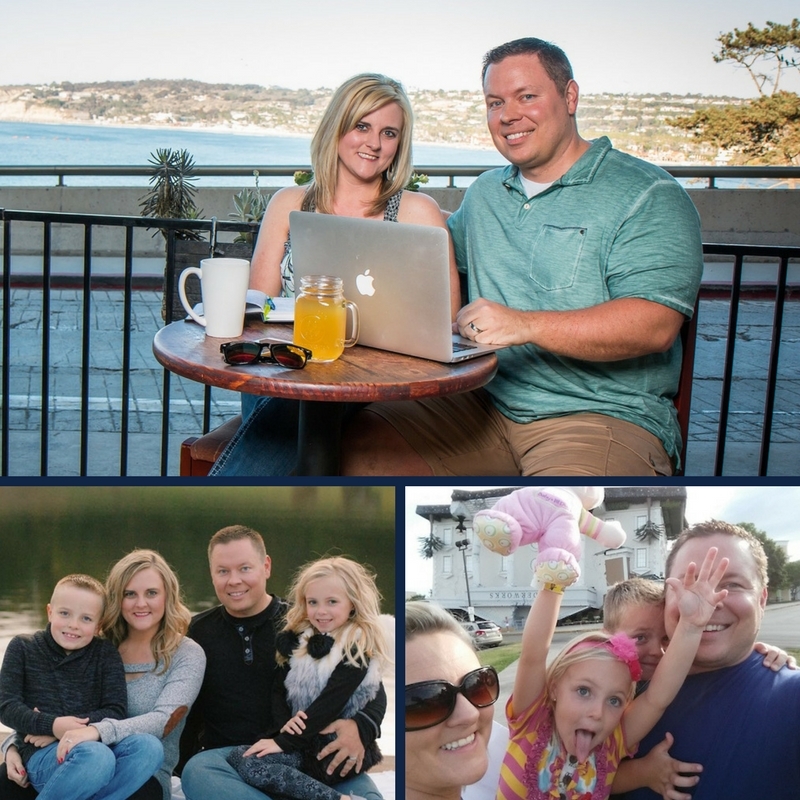 We wanted to create a consistent stream of income that would pay the bills, meet our family’s needs, and allow us to share lots of Can’t Miss Moments with our kids and loved ones. Trust us, we know the struggle is real! We know how hard it is to make ends meet, the stress of living paycheck to paycheck, and having little to no means of investing in ourselves, let alone start our own online business. 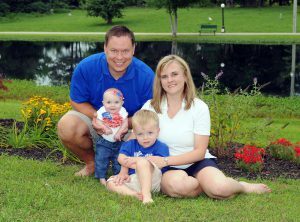 We were parents of, then, very young children (Isaac was a preschooler and Anna Jo was an infant). We had full-time jobs, I was a history teacher and Jocelyn was a school librarian. We lived in Kentucky, where it’s basically unheard of to make money online. So, how did we create the change that flipped our lives? It wasn’t probably the best time to start an online business, but the clock was ticking and we had to make a choice. Now, we look back and we’re just so grateful that we listened to our hearts. We did what we had to do, instead of just wasting our time waiting for the “right” moment. Because if we waited for everything to be perfect, I doubt we’d be where we are now. Our lives changed for the better because we decided to walk this path, invested in ourselves and believed in what we could share with the world. 1. ACTION IS THE CURE TO FEAR. Although your fear of the unknown is valid, you also have immeasurable potential. You have, within you, the power to create change in your life! Every time you take action, you take a step past that fear. Every time you take a step past those fears, you gain vital experience that you’ll need to conquer future fears far greater than the one you’ve just defeated. You see, all it takes is for you to take that first step. So, don’t underestimate yourself and all the amazing things you can share with the world. Your life is a constant testimony of resilience, so don’t be so quick to limit yourself to what everybody else says your life should be. There’s more to life than keeping your dreams trapped behind that cage of self-doubt and fear of failure. It’s time to embrace those bright and endless possibilities that your courage will afford you (and your family). If you haven’t taken action yet, if you were too scared to try, then the moment is ripe for your picking! People who succeed are serious in creating success, they DO what it takes to make their lives better. Because successful people are resilient. People who are not successful prefer to DO NOTHING, they are content with the mediocre. Take action with the intent to succeed and you, ultimately, will. 2. Don’t reinvent the wheel and chase fads. With so many tools and courses available in this day and age, it’s quite hard to stay focused on what you really need to start, build and grow a successful online business. A way to deliver the product. You don’t need a $1,000 logo or 100,000 followers on those social media platforms to start making money online. Keep it simple! The things you need to start, build and grow your online business shouldn’t cost you an arm and a leg. 3. Surround yourself with people with the same goals. There’s a really simple solution to this, guys, GO GET HELP. 70-80% of all business owners (including online business owners) fail to make a return on their initial investment, but people who started, failed, and kept trying, again and again, were about twice as likely to succeed than those people who only tried once. So, we go back to tip #1, which is to take action. But we don’t stop there, WE KEEP TAKING ACTION. Let’s say you’ve already made $100/day, go for the next thing and make $1,000/day! Okay, you’re probably really interested to raise your probability of success. Raising it slightly would mean phenomenal results. Now, what if it that number was even higher than 60%? Having an accountability partner or a mentor can increase your chance of success in anything you do by up to 85%. We are no stranger to tip #3, and the study above is super accurate with what we’ve experienced so far. I mean, seriously, why would you torture yourself that way? When we first started our online business journey, we only had each other. We tried to learn everything we could, we listened to different podcasts and did the research, buy what we thought were useful software but it didn’t change the fact that we were Level 1: Beginners. That’s when we realized that we should probably find people who actually know the answer, people who’ve been there and made it work — we needed to find OUR people. What we needed wasn’t a $500 software, it was ACCOUNTABILITY. We needed people who would push us to work hard and work smart. Throwing ideas around, doing endless research and buying those latest gadgets won’t get you to where you need to be. Surround yourself with people who have the same goals as you, people who believe in what you’re trying to create, people who will give you the insight you need to move past that learning curve. We didn’t succeed doing this by ourselves, so don’t be afraid to meet others who share the same passion to make their lives better. The energy you get from being around these productive, supportive and highly driven individuals will be vital to your growth as an online entrepreneur. You don’t have to do this alone, so don’t be afraid to look and ask for help. Finding a community that fits your personality and core beliefs, will help increase focus, accountability, and motivation — which leads to higher task completion rates and greater probability of success. We hope you enjoyed this week’s podcast and that it inspires you to explore what’s possible for your family! It’s awesome seeing people make those first sales, going through the blueprint, taking action, creating those first digital products, getting them into the marketplace and actually putting your money where your mouth is and promoting them with advertising and good things happen. Mike and Leslie are celebrating those first two eBook sales, and that’s going to lead to more and more. Those eBooks will eventually lead to courses, which eventually will lead the membership sites, and it’s just going to lead to more and more success. So, good job, guys! We’re really proud of you, and we’re celebrating your two e-book sales with you today. Today’s Can’t Miss Moment is a trip to Mexico. This is something that I had been wanting to do for a really long time. When we sold the business back the summer, I pretty much wanted one thing, and that thing was to take a trip somewhere without the kids. We actually have not been on a trip without our kids that was not business-related. We spent five nights at what I would consider a five-star resort down in Mexico. We have people bringing us fajitas on the beach and we went out in the water and just did our thing, just hung out and enjoyed some time together that we really desperately needed. 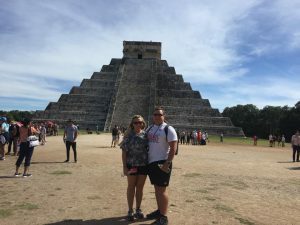 It’s really cold in Kentucky at the time, so we enjoyed the warm weather, we got to go and explore the Mayan pyramids, we got to go snorkeling and we followed this giant sea turtle around — it was really just a dream trip. It costs more money to go on this trip than what we used to make in a month as teachers. This on a whim amazing trip would not have been possible if we had not gone down this online business path. It’s just an amazing experience that we’ll never forget, tons of great pictures and just an awesome, awesome Can’t Miss Moment. Jocelyn: Hey, y’all! 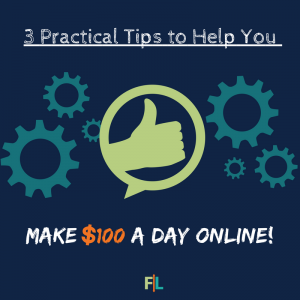 On today’s podcast, we tell you how to get started so you can make $100 a day online. We’re a real family who figured out how to make our entire living online. And now, we help other families do the same. Are you ready to flip your life? Alright. Let’s get started! Shane: You’re not allowed to? You don’t want to, is the real reason! Jocelyn hates it when she has to start the show. I’m drinking a delicious fruit smoothie right now, so I was a little distracted by my protein shake with banana and orange peel that I made earlier. We’ve been on the shake kick lately, but in fruit smoothies and shakes for breakfast and lunch because, you know, summer’s coming y’all! We’re trying to get our beach bodies going here. Jocelyn: And actually, I have a trip coming up with some ladies to Cancun in just three weeks. Shane: And I don’t get to go to that. Jocelyn: No boys allowed. Sorry. Shane: You can see how well our diets are going because we were eating at Cracker Barrel. Jocelyn: Hey, that was for dinner. I earned it! Shane: We earned our dinner by are two delicious protein shakes. All right, but we’re going to get started now because you guys are not interested in protein shakes and our latest fad diet bandwagon we have hopped on. You’re here because you want to make your living online. You want to make money online every single day, and like just imagine what your life would be like if you were making $100 a day every single day online. Consistent, stable, predictable money. That’s one of the most exciting things about online business to us, is this ability to be able to go out and produce and have that passive income working while you’re doing other things, while you’re picking up the kids, while you were asleep. Every single day we get up, I open up our Infusionsoft account, I open up our bank account, and we always make money online. Imagine starting every single day, already making money, not having to wait for a paycheck. You literally wake up and you’ve got money and you have unlimited potential to make more. Our goal wasn’t just to make money online. We wanted to make consistent money online where you know you can pay your bills, know you can take care of your family, and know that you can live the life that you want. One of our first goals, when we set out, was to make $100 a day online. Why $100 a day? Because that’s $3,000 a month, and if we both could do that, that’d be $6,000 a month, and we would know that we’re going to make, you know, $70,000+ a year without having to work for someone else. That hundred-dollar-a-day goal was kinda like real money. I remember how big of a deal it was. If someone gave me $100 once, you know, back then and all of a sudden we’re getting that Ben Franklin in our bank accounts every single day of our life. Shane: When we first started our online business, we had notifications on our phones for when money would come in from like, “Oh, we made money this week–ding!” Or, it would say, like, “Cha-ching!” Or whatever you did, like you got a notification or something. It was really cool because all of a sudden you’d get cha-ching, cha-ching! every single day and it kind of builds your confidence when you start making this much money every single day of your life, that you can go out on your own and you can make things happen. Jocelyn: We’ve actually even thought about bringing the notifications back just for like a motivating thing because when you are first getting started, that is a very, very motivating thing for your phone to constantly be going off, letting you know that you have a payment. And even now like everybody thinks that, “Oh well, you guys have made it, you’re doing great, you never have any problems.” Well, every day we get discouraged about something. I think sometimes, if we were to bring that back, maybe it would bring back some excitement on those days that are kind of hard. Shane: That’s one of the coolest things. We do money now once a week. I do it every Thursday, where we go in, we look at money in, we look at money out, and all the boring stuff you have to do to run your online business. But when you do start making $100 a day, you know, $500 a day, a thousand dollars a day, whatever it is, it is that consistency that drives you forward, that gives you confidence. That’s the difference I think in online business, and working that nine-to-five grind, is you get that paycheck every couple of weeks, or you get to literally make money every day and see it happen. That’s why you’re here listening to this podcast because you want to make $100 a day. You want to make a consistent income online. It’s why you start an online business so that you can earn money every day and find freedom. Jocelyn: So at this point, you might be thinking, making $100 a day online sounds great, but it’s a little bit scary to start an online business. First of all, you do have to risk your time and some money to get started. There are a lot of people out there who want you to think that it’s totally free to start an online business, but we all know that that’s not true. You do have to take some time to write some content and get people coming to your website. You do have to spend a little bit of money to buy a domain, to buy hosting, to get your websites started. So, there are a couple of things that we understand, as people who’ve started in business before, that is not just so easy just to flip the light switch and start making money. Shane: It always makes me laugh because Jocelyn and I get a lot of emails, we meet a lot of people at conferences and things like that who’ve heard the podcast or do this and that and the other, and they come up to us and say, “Oh man, I’m so excited! I want to do this, I’m going to get started, I’ve got my idea, I’m going to go for it,” but then when it comes time to bet on themselves to go out and invest in their future, they get tight-fisted and they get right to the edge of the diving board and they turn around and go climb back down the ladder. Because that fear of taking a chance with their time and money just holds some people back. We totally get it, y’all. When we started out, we had limited budgets. We had no time. We had two small kids. We were both working full-time. I was basically working two jobs because I was teaching all day and coaching all afternoon. Money and time were extremely tight when we first started out. We always tell people, you know, we were working paycheck to paycheck, and the paycheck ran out Thursday before you got paid on Friday. We just didn’t really have any room in our budget to be investing in things. It can be so confusing when you’re first starting out online because you see all of these tools and all these things that the experts say you are supposed to buy and you’re supposed to do, so what do you invest in? How do you know you’re not throwing your money at something that’s not going to give you any return back? Without some guidance, it is really easy to get $50 a month to death buying the latest tools for sales pages and CRMs and autoresponders and all these things, if you’re not careful about it. Jocelyn: And on top of all that, you may even start questioning, is this right for my family? Is this really where I should spend my attention? Is it really where I should spend my money? What am I sacrificing to be able to do this online business? It could be a lot of different things. For some people, maybe you say, well, I spent a lot of money to get a degree. For us, we got a teaching degree. Shane: Oh my gosh, we both had master’s degrees and had taught for– was I in my ninth year? 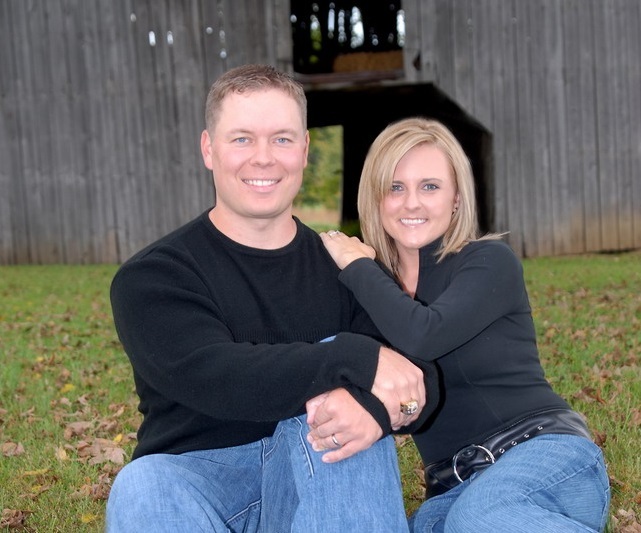 I was going into my ninth year when we started our online business. That’s a lot of life that we had invested in our jobs. Jocelyn had already changed careers twice just to be a librarian. She was an MBA dropout and then went back and got her library degree. Jocelyn: Some people probably thought that was crazy, that we spent all that money to become teachers. We had all that experience to become teachers. In fact, our certificates expired this year. As of the end of this year, we are no longer certified teachers. Shane: We’re not? I did not know that. I don’t keep up with stuff like that, guys if you haven’t figured that out. I’m glad that you’re keeping up with that. So, we’re really at the point of no return. Jocelyn: This is the point of no return. Shane: This is it. We cannot turn back no matter what. And what’s funny is, the world kind of scares us into the status quo, wants us to stay the course and go to college and get a job and have a career and work for 35 years and then retire. 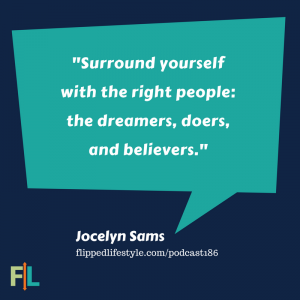 Jocelyn: But we found a lot of times when people who come into our Flip Your Life community, that they had been on that path. Maybe they’ve been there for a decade, maybe longer, and they realize that the world is not everything that people said it was. Even if people go to school to get “A good job.” Here in Kentucky, if you are, say, a doctor or a lawyer or some type of professional job, that’s like a good job. But what we find is that people start getting restless and they say, “OK, this isn’t what everybody told me it was going to be.” Either you trade a lot of time for a lot of money. Shane: Or a lot of time for a little money. Jocelyn: Yeah, And what’s the point? We have so many people and you know, there may be people out there who love their job and congratulations to you. I’m totally happy about that. But there are so many other people who are not happy with their job and they’re looking for something else. Shane: And the problem here is that people really look at it and say, you know, you look at the life that you’ve “built.” You’ve made this investment of time in your twenties, you’ve made this investment for your family into a house or a job or whatever, and you start looking around and you get so caught up in keeping what you have, that you lose the ability to dream about getting more or going back and getting what you really wanted just because you’ve achieved a certain level. I think this happens at various times through life. Jocelyn and I have just gone through about a 3-6 month period where we created some big dreams, we created some big plans, we sold off parts of our business that was really, really successful so that we could focus our attention on helping more people in the Flip Your Life community. But that required going out and hiring more people, building a bigger team, doing some things that really pushed us out of our comfort zone and kind of terrified us again and made us scared of moving forward because we were like, “Look at all this, we’ve already created, why are we risking all this to get to “the next level” or to reach more people or to help other people?” We got close-fisted. We kind of step back just like we even did when we first started our online business before we made $100 a day online before we could quit our jobs, we got scared. We said, “Hey, are we risking everything we’ve already built? Are we going to lose all of this to try to get that dream, to try to go for more, to try to do something else?” Something else that’s really scary is maybe taking one step back so that you can take three steps forward. Maybe it’s not giving up everything, but maybe it’s, “Hey, I make $50,000 a year. What does $100 a day? That’s less than that.” You don’t get to $100 a day and stop. That’s just the first step you want to get to a thousand dollars a day, but it can be really scary to take that step back or to take that risk of what already earned through your master’s degree, through your career or whatever it is. Jocelyn: Guys, we know it can be scary and very frustrating to think about, “OK, I need to do all this work and spend all this money.” It’s scary! We understand. We’re still dealing with it now just as Shane said, as we start to grow and you know, we go through some of the same types of thing. Shane: It never goes away. That’s why it’s so important in the beginning to just get over it because every time you go to the next level, there’s more frustration and it’s scary, but when you get there, it’s awesome. Jocelyn: There are a lot of things to spend money on. It’s very intimidating. You don’t know which way to go. You’re not sure which tool is the best. You’re not sure what you really need. Then if you make the wrong decisions or you just jump in, maybe you’ll be wasting a lot of money and never see a return. Shane: We really do get it. We’ve been there and we’ve seen hundreds and hundreds of people follow this Flip Your life journey to get there, too, and every time it’s there. So, what we want to do today is we want to give you guys some practical tips so that you can get started, so that you can get to $100 a day or a thousand dollars a day or wherever you want to get to in your online business. We want to give you some advice to help you get over those fears, get over that frustration and keep moving forward so you can make your online dream a reality too. Jocelyn: Let’s talk a little bit about how to overcome the fear of investing in your business and betting on yourself. The first thing is taking action. We talk about this all the time on the podcast. 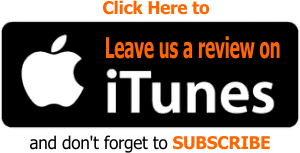 If you listen to our podcasts, probably ever, you know that we are firm believers in taking action and getting things done. People who take action are going to make it ultimately, and people who don’t, well, they’re not going to get anywhere. I’ll always say that baby steps get you closer to your goal than standing still. So, if you’re still standing still, standing on the sidelines, wishing and hoping that you can make $100 a day, start taking action. Shane: It’s so funny whenever anyone comes into the Flip Your Life community, the first thing they ask us is, “What email provider should I use?” or “What payment processor is should I use?” Or “Where should my host my website?” And we’re like, “Hey guys, it doesn’t matter.” People get so caught up in each little individual tool and every little thing they’ve got to set up when really it’s just… START. Pick one! Pick the email provider, pick the platform, pick whatever it is. Choose your product, choose your business. It doesn’t matter. You just have to take action and get started. Here’s the truth, guys. Most of the time, the first thing you try is going to fail. I know you don’t hear a lot of gurus say that. You don’t have a lot of experts say that, but we’re going to shoot straight with you. It’s probably not going to be a home run as soon as you swing. You’re probably not going to make $100 a day on the very first thing you try. The more important thing is, you start trying. You just start swinging so you can eventually go up to the plate over and over and over again, and eventually hit something out of the park. I was actually just reading a study the other day from a professor at Harvard Business School and it said 70-80% of all business owners, including online business owners, fail to make a return on their initial investment, so that means that only like 20-30% percent of people who start an online business is actually going to make money on their first idea. I know we didn’t. We failed multiple times before we finally found something that made a little money. The interesting thing about this article was that it also studied people who kept going. The study showed that people who started, failed, but then tried again, were almost twice as likely to succeed as the people who only tried once. And here was the crazy part about this article that I read that really blew my mind: if people tried a third time or fourth time, they were 10 times more likely to succeed. So what this study proved was, it wasn’t the geniuses that had the greatest idea in the history of mankind that got to be successful, it was the people who tried and then tried again, and then kept going until they found something that worked. It wasn’t their education that mattered or their status in life or their inheritance or their background or anything like that. The only thing that mattered was taking action over and over again, and I want to be really hard on some of you who are listening right now. Some of you haven’t even tried once. You just listened to the podcasts all the time. You look up articles, you read success stories. You hear us talk about it every single week. You hear us interview people from our podcast. You haven’t even started yet, no wonder nothing is happening in your business. If 80% of the people who try once failed, 100% of people who never tried will fail. You have got to do something to take action even if you’re afraid, even if it’s the wrong action, you’re better off doing something if you want to go out and build an online business. Jocelyn: This also goes for people who maybe have gotten started. Maybe you have designed your website or maybe you have registered your domain and you think, “Oh, well they’re not talking to me. I’ve gotten started.” But what are you really doing? Are you making progress towards your goal or are you tinkering with the logo or trying to come up with the content calendar or something that doesn’t really matter? Shane: This makes me think about our son, Isaac, what Jocelyn just said, actually. Isaac is really into basketball right now. He just joined a travel team. He just got done playing Upward. We were undefeated by the way. I was the coach. I’m just saying. We won every game. I’m just saying. It was awesome. But I was thinking about him today. I was telling him, “Son, let’s go out and work on your dribbling.” He’s like, “Dad, I know how to dribble.” I’m like, “Yeah, son, but everyone else can dribble better than you.” We have to go do the things that matter. He was sitting there playing Xbox and it was like, “Man, we’ve got to go out and dribble so that you can get on this team, and actually gets some playing time.” Yeah, you know how to dribble. Like if you’re listening right now, you, if you’ve heard our podcast a few times, you probably know how to start an online business. You know how to do that, but you’re not getting the reps. You’re not going out and practicing it. You’re not doing the proper fundamental things that actually build your business and get to the point where you can make $100 a day or a thousand dollars a day in your online business. It’s one thing to know how to do it because you heard a few stories or you saw someone or you went out and started dribbling. It’s a whole other thing to do the fundamental things that it requires, to make the investments that you have to make to be able to go out and actually make your entire living online. And Isaac, you know, he’s intimidated to go out there with the other kids who are better than him. There are people out there that are dribbling circles around him and you know, he got his first rebound in a game the other day. He went back out to shoot it and some giant behemoth kid who was like six-foot-tall in fourth grade swatted him into the third row. The ball went flying and you know what, hey, that’s fine. At least he took the shot. The next time, he’ll learn, how do I avoid that guy? It’s the same thing with online business. You just have to try and try and try and try again. Our biggest frustration with a lot of people who listen to our podcast is, you guys need to try to succeed. Who cares if you fail? You’re already not doing it. If you try to make $100 a day online and you don’t do it, well, guess what? You’re already not doing it. But if you do do it, and you do start making $100 a day, and that starts growing, well, then all of a sudden you are free and you have built an amazing life and future for your family. Jocelyn: Kevin said, “OK, well my initial idea is not working, so I’m not going to give up. I’m going to jump in and I’m going to try something new.” So we worked with Kevin through our community, and through our training to come up with a brand new idea, a brand new website, and a brand new community. And now we are so excited to say that Kevin has a lot of members now, dozens of members. Shane: He is making consistent money online. He is moving toward that hundred dollars a day online and when he started, we all three said, we literally said to him, he’s been on this podcast. We said, “we don’t know if it’s going to work.” We had no clue, but let’s try and find out. He did. He took action. He got members. He’s making money online. He’s moving toward replacing his income and going out there and living his dream. That’s what you have to do, too. Everyone always comes into our community saying, “Hi, is this going to work? I really want to know this is going to work before I try.” You never know until you try. The bottom line here is that taking action is the only difference between those who never make it, and those who do start making money online, those who grow to $100 a day online, those who replace their income, quit their job, and live the life that they want. People who make it take the next step. Even if the last step they took went backward, they take the next one. The only thing that’s going to guarantee your failure is not taking action. If you start, you can make $100 a day line someday. If you don’t, you won’t. Jocelyn: Alright, the next tip to make $100 a day online is to figure out exactly what you need to invest in when you get started, and to avoid things you do not need. There are really only a few things that you need to make $100 a day online. First of all, you need a website, you need a product, you need some software to market the product, software to protect the product so that people can’t just search for it and find it. Then you need a way to take payments and a way to deliver. That’s it! Shane: It really is that simple, guys. People overcomplicate the issue, no matter how in depth and crazy your email autoresponder gets or your sales funnel or whatever. If you have a place where people can find you, a place where people can buy your stuff, and a way to deliver the stuff they buy to them, you’ve got an online business. You can go out and make $100 a day. One of the little games that me and Jocelyn play is when we go to Disney or when we go to the beach or something, we always check our phones throughout the day and log in and see if we made any money. Our goal was to like make more money that day than we spent in the amusement park. So I was telling Chris about this and he’s like, “Oh, I’m going to do that. I’m going to do something.” So he goes out and basically creates a product like out of nowhere, he throws a video up like for a sales page, and he just posted this thing and emails it to his list, right before he goes to Disneyland. He literally made a page on his site, put this new course on it, which was like a 30-minute video, protected it, and put a price tag on it and said, “Here you go, go buy it.” And Lo and behold, he took action, and this product made more money online than he actually spent at Disneyland the day he was there. Don’t get caught up in all the things that everybody says you should do. You don’t have to invest a lot of money into a lot of different products to get started. It’s probably a lot cheaper than you actually think. That might be why you’re scared to go out and make this investment. You think got to spend a thousand dollars a month on all of these tools. Jocelyn and I spent about a hundred dollars a month probably for the first six months to a year that we were in business. So it’s not really a major, huge investment that you have to make to be successful and get to that hundred dollars a day mark. Jocelyn: This is why we created all of the training in our Flip Your Life community, is to help you to know what are the important tools that you need and which ones do you not necessarily need at the beginning. Shane: Alright? So we figured out that you’ve got to take action to bust through fear and get this thing started if you want to get $100 a day online. We’ve talked a little bit about the tools and the actual things you need to invest your money in when you’re starting your online business to get it off the ground and get it going so that you can make money online. But how do you know you’re making the absolute best decisions in your online business for your family? to increase your chances of success? Maybe you’re like Kevin and you’re not quite sure if you exploring the right ideas online. Maybe you’re stuck on what product you should create or maybe you’re just having trouble getting things done and you need some accountability. How can you be sure that you’re making the best possible decisions moving forward? There’s a really simple solution to this, guys, you need to go get help. You need to ask advice from people who are already doing it or have done it and you need to go out and find some good accountability partners because none of us can make ourselves do this alone. I read an article on a magazine the other day that said, “Having an accountability partner or a mentor can increase your chance of success in anything you do by up to 85%.” You have to surround yourself with people that force you to do better and make you get things done, especially when you’re doing something like online business because a lot of the people in your life are not going to get it. You’ve got to find some people around you in your life that are going to help you get to the next level. Jocelyn: And don’t ask these people, “Hey, do you think that I should join this accountability group or finding an accountability partner for online business?” because it’s like Shane said, they’re going to tell you NO. People are comfortable where they are and you’re the one who’s wanting to make a change. You’re going to be the outsider and trust me, we know all about this. We’re the outsider in so many areas of our lives. This is actually one sort of unfair advantage that we had starting out is that we had each other. We were both very driven and wanted to achieve success in this area, so we challenge each other, and I mean who better to do that then your spouse, because my spouse challenges me every day! Shane: I see what you did there, that’s not cool, man. Not cool. Jocelyn: But in all seriousness, we really did. I mean we both wanted to achieve success, we were both very serious about doing it, and that made it more possible for us to be able to say, “OK, let’s branch out and do this.” Even if everyone else out there thinks we’re nuts–and trust me, they did–we’re going to do this anyway. Shane: And maybe it’s not your spouse. We know a lot of people that that’s a conflict. That’s actually a struggle in some people’s journey, is how do you get your spouse on board? How do you do that? We’ve talked about that for entire episodes on this very podcast, and maybe you live in an area like we do. We live in South East Kentucky. The median income in our area is like $28,000. Most people don’t even know how to get on the Internet, let alone how to build an online business. Maybe you don’t have anyone around you in your life to build that accountability network, to find someone to mentor you through this process. Once again, you’ve got to make something change or nothing will ever change. Jocelyn and I, even though we had each other, still got stuck, still needed accountability and still needed to surround ourselves with other people who were reaching for more success. We flew all over the world, to find that accountability. In the first couple years of our business, we went from Kentucky to California, to Portland, Maine, to the Philippines. Anywhere we could go to surround ourselves with what we thought were the right people. We did it. We made it happen. We made the investment at the time, we made the investment in the money. Anything we could do to get to these places so that we can surround ourselves with people that were trying to make it, too. It’s actually the number one reason why people tell us they join our community. It’s not because of necessarily our content or courses or anything like that. You can find people to show you how to set up an email autoresponder. You can find people to set up a WordPress website, but it’s hard to surround yourself with the right people who are going to motivate you and hold you accountable to be successful. A member of our community named Ashlyn just sent us a video last week and she said in it, “When I’m in the Flip Your Life community, I feel like I’m with my peeps!” You really do need to find a community of people who are going in the same direction as you if you were going to make it as well. Jocelyn: Honestly, I think that’s one of the main reasons that we started taking our business to the next level is because we did start surrounding ourselves with people who understood; people who were going through the same types of things that we were going through and we were able to share strategies and ways that we were moving forward despite the obstacles, and that’s why it’s really important for you to come up with a community or to find a community that is like you, like us, we have a family. We know how to start a business when we have young children, when we have full-time jobs, we get that. And so I think that’s the reason that our community has been successful so far and also the reason that we were able to succeed so fast. Shane: I remember when you first started out, we’d just quit our jobs. We weren’t making a ton of money online yet. We had had a couple of really good months but we weren’t being as consistent as possible. We said, “Man, we have got to get out of here, we’ve got to go find some entrepreneurs.” And there was an event happening in San Diego, California, and we flew out there just to meet some people. And I remember when we were on one of those calls, we were talking about live events and we were like, “Hey, do you think we could host a live event? And they were like, “I don’t know. You think we could do that?” And this was before the Flipped Lifestyle podcast was popular. This was before they had built their brand. You know, neither one of us had huge followings at the time. So we didn’t even know if anybody would do it if anybody would come to our live event. But we challenged each other. We held each other accountable, we created this big plan and we executed it. And we put on one of the best live events you could ever go to in San Diego, California. They lived in Canada. We lived in Kentucky. We met there, we planned this whole thing and that really showed us, man, when you surround yourself with driven people when you dream huge and hold each other accountable and you make yourself, like, “Hey, we gotta get this done for them. 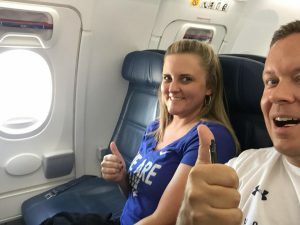 They’ve got to get this done for us,” it just made all the difference in the world and that’s what started making us think about things like a six-figure month, seven-figure year selling businesses for a million dollars or more. All those big dreams came from surrounding ourselves with the right people. Shane: Alright guys, that is about all the time that we have today. If you are just starting out or you are building your online business, don’t suffer through all the trial and error like we did. You can avoid a lot of wasted money and a lot of wasted time if you joined the Flip Your Life community, we designed the Flip Your Life community to help families reach their goals. 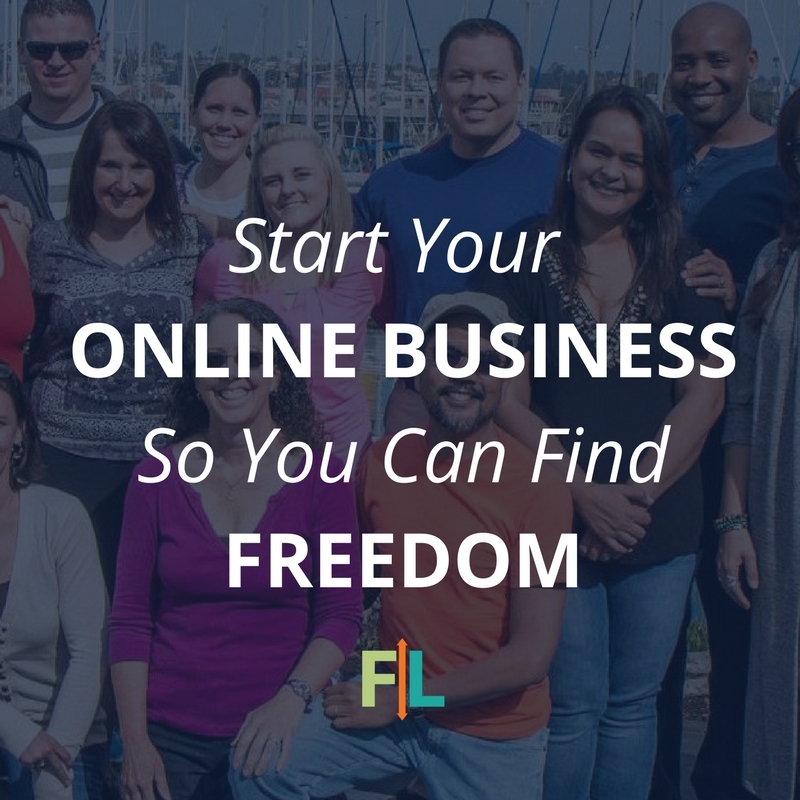 The Flip Your Life community is here to help you overcome the fear and the overwhelm in starting building and growing your own online business. Whether it’s making $100 a day online or quitting your job, whatever your goals are, we can help you succeed faster. 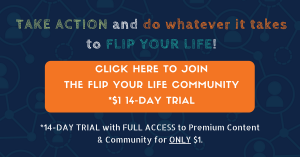 If you’d like to get started today, go to flippedlifestyle.com/trial, and you can join the Flip Your Life community for fourteen days for just $1. There is no reason to not invest $1 in the future of your family and your online business. That $1 will get you unlimited access to the entire Flip Your Life blueprint. That’s all of our courses, all of our workbooks, and guides. You’ll have unlimited access to our community forums where you can ask as many questions as you want during the 14-day trial. You’ll also get access to our next live member Q&A where you can ask me and Jocelyn a question and we’ll answer it for you on the call. 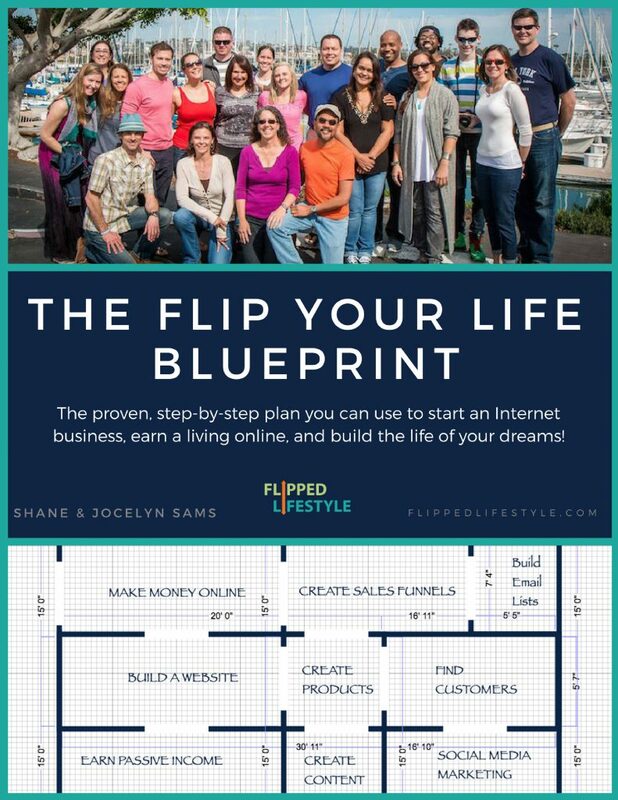 That’s complete access to the entire Flip Your Life community and the entire Flip Your Life blueprint for just $1. Wouldn’t it be awesome to trade $1 for a chance to make $100 a day online? Of course, it would! 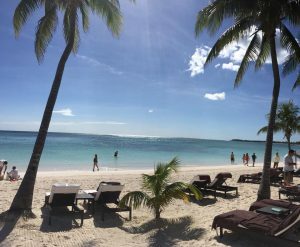 So, go right now to flippedlifestyle.com/trial and get started. No risk. Cancel any time and look, if you don’t like it will send you your dollar back. I’ll put it in an envelope. I’ll mail you a dollar and you’ll get your dollar back so there’s absolutely no risk. We’d love to have you inside of our community and we would love to help you start, build and grow your own online business. That’s flippedlifestyle.com/trial. Jocelyn: All right, it is time to move into our Can’t Miss Moment segment of the show, and these are moments that we were able to experience that we might have missed if we were still working at our normal 9-to-5 jobs. Today’s Can’t Miss Moment is a trip to Mexico. This is something that I had been wanting to do for a really long time. When we sold the business back the summer, I pretty much wanted one thing, and that thing was to take a trip somewhere without the kids. We actually have not been on a trip without our kids that was not business-related. Well, it was kind of business-related, but that was not primarily business-related in about 10 years. Shane: Usually we go on two or three trips a year where it’s just us, but it’s usually going to a conference or to connect with people. Maybe we’re traveling with friends and this was just second honeymoon type stuff. Me, Jocelyn the beach, relaxing for four days. Jocelyn: And still talking about business every day. But it was still nice just to not have any type of responsibility. We didn’t have any events to go to or any other people to talk to because I’m an introvert and that’s important to me. Shane: We literally spent one day. 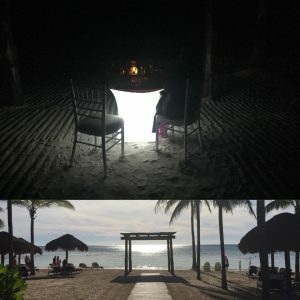 We rented these private cabanas out on the beach. Yeah, we went to an all-inclusive resort. There was a bed inside the Cabana and we just pulled the curtains and slept for like five hours one afternoon with the ocean 20 feet from us and we totally went into introversion mode during this trip. Jocelyn: We spent five nights at what I would consider a five-star resort down in Mexico. We have people bringing us fajitas on the beach and we went out in the water and just did our thing, just hung out and enjoyed some time together that we really desperately needed. Shane: It’s really cold in Kentucky at the time. So we were in the warm weather and we got to go and like explore the Mayan pyramids that Chichen Itza and we got to go snorkeling and we’d follow this giant sea turtle around. And it was really just a dream trip. I mean, we took so many great pictures. I got so many great pictures on my phone now, that I can look back on and just me and Jocelyn on this trip. It costs more money to go on this trip than we used to make in a month as teachers. So this would have never been possible to, just on a whim, say, “Hey, let’s go on this amazing experience trip,” if we had not went down this online business path. It’s just an awesome trip, an amazing experience that I’ll never forget, tons of great pictures and just an awesome, awesome experience. Mexico was the definition of a Can’t Miss Moment. As much as we love our Can’t Miss Moments, there’s actually one thing we love even more and that’s a success story from our Flip Your Life community members. So, before we go, we wanted to share an actual success story from the success forums in the Flip Your Life membership today. Shane: Been there, done that. Shane: Exclamation point. I like these people. I like people that use lots of exclamation points. Shane: That’s my jam, exclamation point. Shane: This is like an 18-exclamation point post so far. I’m loving this. This is amazing! Shane: What an amazing success story. It’s awesome seeing people make those first sales, going through the blueprint, taking action, creating those first digital products, getting them into the marketplace and actually putting your money where your mouth is and promoting them with advertising and good things happen. Shane: Alright guys, that is all the time we have for today. Before we sign off, we like to close every one of our shows with a verse from the Bible. Today’s Bible verse comes from Colossians 3:23, and the Bible says, “Whatever you do, work hard as if working for the Lord, and not for man.” Remember guys, everything in your life, there is a bigger picture at stake. You don’t have to please anyone. Just go out there, and the use the talents, and use the abilities that God has given you. Get out there, and use it to change the world, and make something happen in your own life. That is all the time that we have for this week. As always, guys, thanks for listening to the Flipped Lifestyle podcast, and until next time, get out there, take action, do whatever it takes to Flip Your Life.